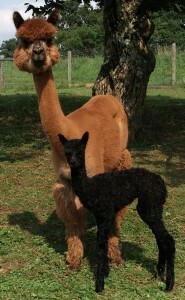 Congratulations to Randy and Tammy Williams on two new additions to their alpaca herd! Last year they purchased one of our farm favorites, Obsydyan, as a companion for their alpaca Miracle. Many of you will remember Syd’s story of being adopted at 6 weeks after the sad loss of his mother Tequila. Syd’s sire was our beautiful gray herdsire Gryffyn. 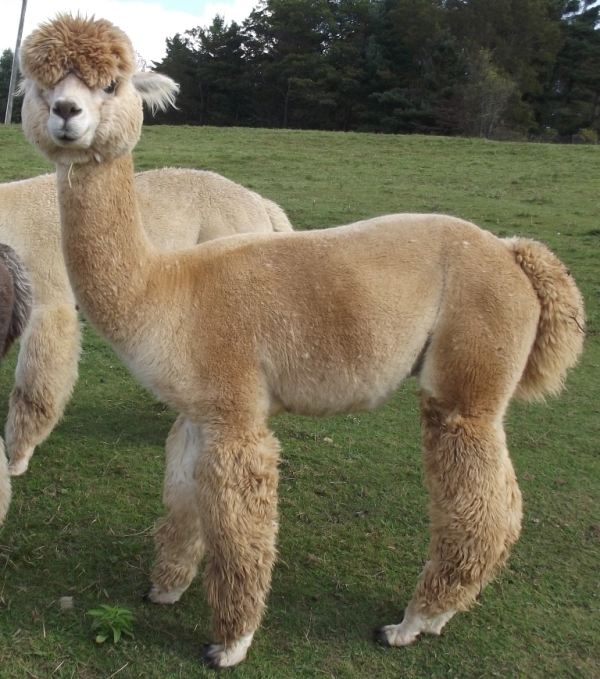 This year they added the adorable Dante to their herd during our Alpaca Pen Sale. Dante is the son of our true black Champion herdsire Maximus and our sweet Ima Joy, who is also Syd’s adopted mom. As Dante was getting settled in to his new home, they were blessed with the birth of Obsydyan and Miracle’s little girl, Misty Grey. Misty Grey reminds me of her grandsire Gryffyn. Below is a great picture they sent of the whole herd getting greeting their newest farm member. We still have room for more to join us for a few of our upcoming fiber art classes. This month we added a Weaving on the Triangle Loom class to our schedule since the other classes filled so fast. Our August class is full, though there are a couple spaces available in our October class. This month you can join us July 24-26. We will begin on Friday evening July 24, weave all day Saturday & Sunday, and you will go home with a beautiful alpaca shawl that you designed and wove. 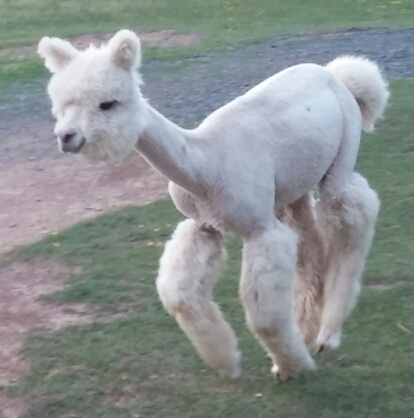 The class is a lot of fun, you will have beautiful alpacas to watch as you weave, and there is great food throughout the weekend. We hope you can join us. For more information on the schedule and cost, click here. You can see pictures of our previous weaving classes here. On August 1, we have a special class led by local artist Karen Carney. 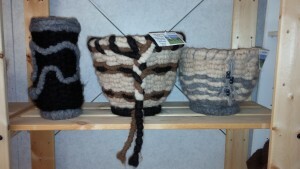 We will be weaving alpaca baskets out of thick alpaca rug yarn. These yarns are all made from the fiber of our alpacas, and come in a variety of natural colors. You can learn more about the Alpaca Basket Making class here, and see pictures from a previous basket weaving class here. July 7 was an exciting day on the farm. Visitors to the farm were the first to see that June Delight was ready to give birth. We had a number of visitors who witnessed the whole birth process. Peaceful Heart’s Delightful Rain was born around 2:30 pm, and entertained the farm visitors, who enjoyed watching her first efforts to stand and nurse. 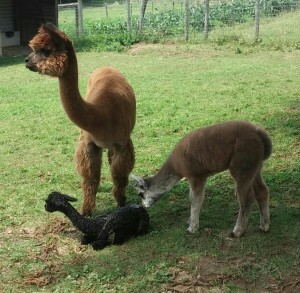 She weighed 19.6 pounds and is a beautiful true black girl with dense bundled fleece like her sire Polar Ice. As excited as everyone was to see Rain, no one was as happy as Windy Darling. Windy has been waiting for a playmate since her birth on June 22. You can see both of our new alpaca crias when you visit the farm. 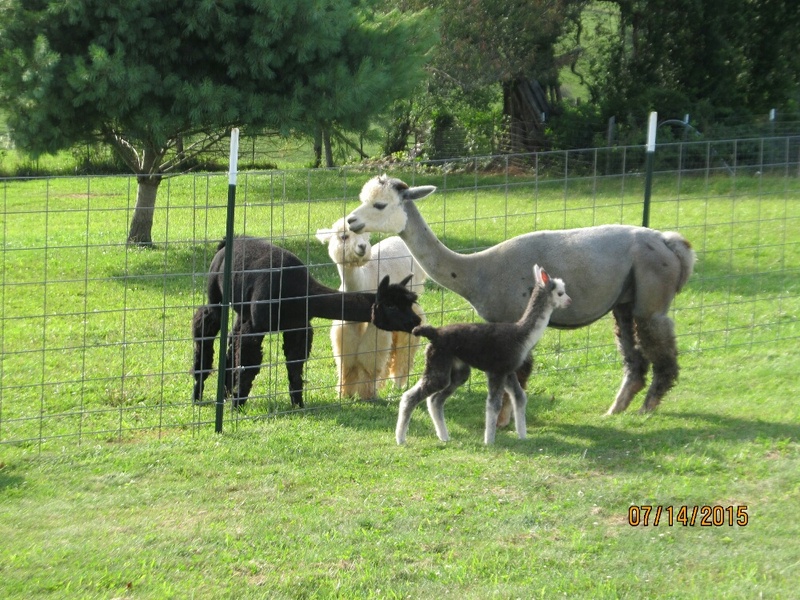 They and their mothers are in the pasture in front of the store. Join us July 18, 2015 for Peaceful Heart Alpacas’ Second Sit and Knit (or crochet) with the alpacas. 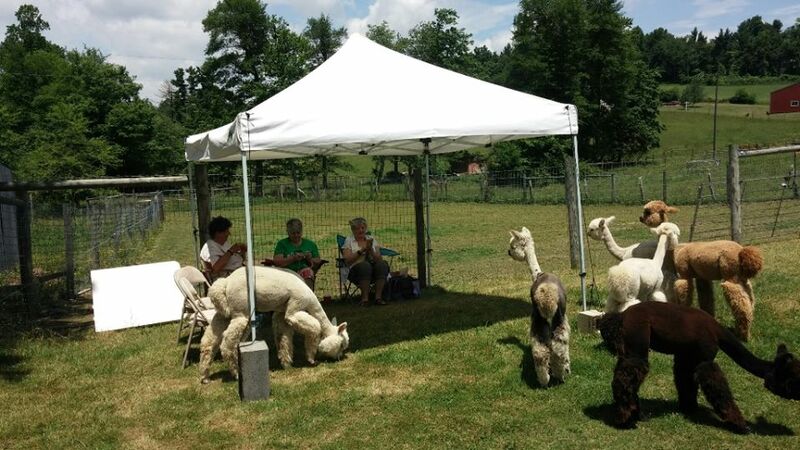 We will have tents set up in the pasture with the alpacas where you can relax and enjoy the alpacas while you have fun working with your alpaca yarn (weather permitting). 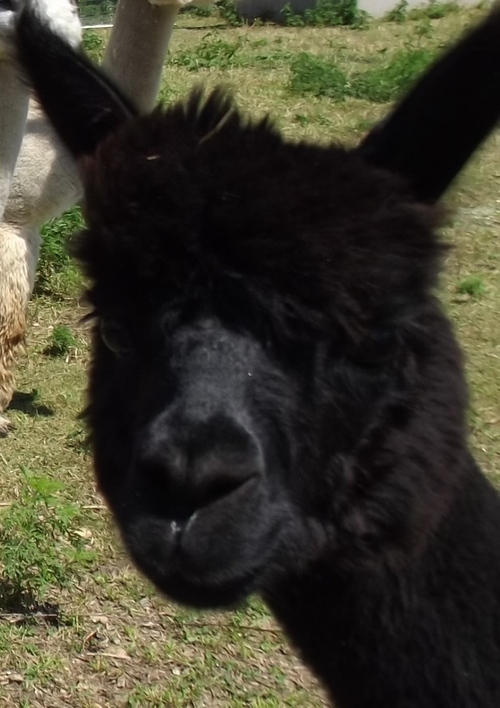 Alpacas are curious. They may come up to see what you are working on. Last month the alpaca boys wandered in and out of the tent with us. 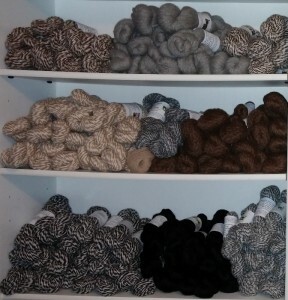 We will have special discounts on some yarns, and will have a limited supply of Needles and Notions for sale at 40% off. While supplies last, you will receive a free pattern with every yarn purchase. 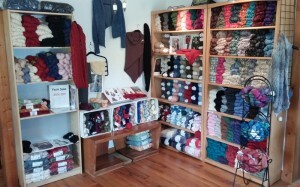 The Sit and Knit will take place during our regular hours on Saturday, July 18, 10am-5pm. Come and join us at no charge, for as long as you like. We will have a Triangle Loom set up and be demonstrating weaving throughout the day. 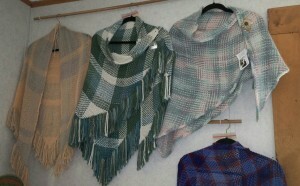 We will also have samples of items made in our other fiber art classes. You can register for any of our Fiber Art Classes online, by phone, or in the shop. We hope you can join us for this fun and relaxing day. There is no need to register for this open farm day, but please send us an email if you are planning to join us so we can set out enough chairs for everyone.